One of my very favorite things to review here is coffee. I really just adore coffee and I'm lucky enough to be able to drink it in the evening and still be able to go right to sleep. So last night I brewed myself a cup of Eight O'Clock Coffee and I really enjoyed it. It was the French Vanilla flavor, and as it was brewing, I couldn't help but love the aroma that was filling up the kitchen. It tasted delicious, with a sweet vanilla and caramel essence. I have also tried their Original Blend and that was also good, very smooth and full bodied. All Eight O'Clock coffees are made from a blend of premium 100% Arabica coffee beans medium roasted. The company has been in business since 1859, with over 150 years of offering their beans and ground coffees. They currently have the enviable position of being the #1 selling whole bean coffee in America. 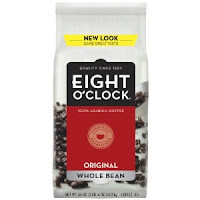 You can find Eight O'Clock Coffee at many major supermarkets, and at most Wal-Mart Supercenters and Sam's Clubs. It is also available on their website. They offer their Original Blend, flavored, and decaffinated, available in whole beans or ground. Coffee is an easy and welcome gift, especially at the holidays. Eight O'Clock coffee would be a wonderful choice to give any coffee lover you know. 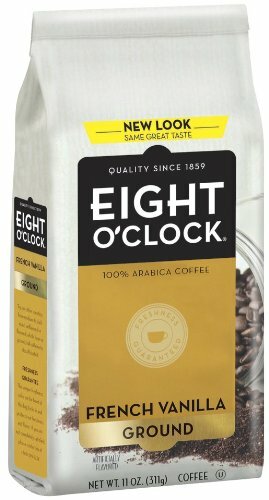 What flavor of Eight O'Clock Coffee would you like to try? I would like to try the French Vanilla! I'd like to try the Eight O'Clock mocha coffee. I like Eight O'Clock Coffee on Facebook (FB name: Maddie Brubaker). I follow Eight O'Clock Coffee on Twitter (@shala_darkstone). I like 8 o' Clock coffee on FB as Sam Whitney L.
I follow 8 o' Clock coffee on Twitter as @Ramblesahm. I would like Dark Italian Roast. i'd like to try the original blend. "Like" 8 O'Clock on FB (Mandy Peters Kauffman). Follow 8 O'clock on Twitter (SuperGrover83). I would love to try the original ground.